The smoothie recipes listed here are ones that we have personally tried and they are quite nutritious and very delicious. The water that is recommended is steam distilled so as to have pure water without all of the impurities that you can get in city water. If you can get organic ingredients, so much the better. If not, just be sure to wash everything thoroughly before putting it into your smoothie. You can add whatever you want to make a smoothie. Do you need more energy? Add power boosts like bee pollen, Jurassic green, or wheat grass. Are you looking for vitamin A? Use more carrots which have beta carotene and are great in any smoothie. You don't have to use water. You can use soy milk, yogurt, coconut milk, almond milk, or any other liquid that you like. We love the taste of coconut water in our smoothies, but almond milk is another favorite. A smoothie is a great way of getting great nutrition in a hurry. You can add nuts, seeds, fruits, vegetables, the sky is the limit. We find that we like our smoothies very cold and icy so if we are using fresh items, we'll add some ice to make them of the smoothie consistency. If you have any recipes you would like to share, please send them to us on our contact page. Be creative! Be healthy! Be nutrition conscious! Pictured left: A delicious fruit and vegetable smoothie. It cannot be stressed enough how diet affects your health. It seems that when you mess with people's taste buds, they don't take it well at all. The basic premise of a healthy diet is in your control. Do you want to live to eat, or eat to live? So many diseases can be helped with the proper dietary changes. If you are not willing to make the changes necessary to assure you can live without disease, then that is totally up to you. How much is a healthy body worth to you? Would you rather spend your money on doctor visits, drugs, treatments and all sorts of things that don't address the underlying problem, or are you willing to do what it takes to make the changes necessary so that you can enjoy your life and spend your money on more pleasurable activities? The choice is yours. if you are willing to make the changes necessary, feel free to contact us and we will give you suggestions to help you along the way. Remember: good health is up to you! Place all of the above in the order listed into a power blender such as a Vita-Mix or Blentec type of high speed blender. Blend about 1 minute or until all ingredients are blended smooth. Enjoy! A great start for breakfast for anyone who doesn't have time to eat a regular healthy breakfast. Place ingredients into a high speed blender. Blend until smooth and creamy. Enjoy. Place all ingredients in a high speed blender. If using frozen fruit, allow it to sit at room temperature for 10-15 minutes before blending. Blend at high speed for 1 minute or until smooth and creamy. Enjoy! Blend in a power blender for 1 minute or until it is fully mixed and smooth. Any of these items can be fresh or frozen. If they are fresh, you can add some ice to make it very cold and thicker. If they are frozen, you will need to let them thaw for 10 minutes before using your power blender, and you also may need to add some liquid to them such as distilled water, juice, almond milk, etc. Add all to power blender. Blend until desired consistency. Place ingredients into high power blender in order listed. Secure lid. Blend until smooth and creamy. Place almond milk in bottom of high speed blender. Add other ingredients. Blend until desired consistency. This is really a great thirst quencher and just look at all of the nutrition! Mix all lf the ingredients in a high power blender. Mix until smooth. Enjoy. healthy fruits and veggies like watermelon, which helps dilate blood vessels to promote blood flow. Also, it has coconut water – one of the most hydrating liquids out there. Another positive aspect of coconut water is that it reduces blood pressure which can make you lethargic. The best part is this recipe yields a big batch, so it you can make it once, freeze it, and drink it all week long. You can also add any additional boosts to it if you desire, such as bee pollen, protein powder, whatever you want. * You can add 1 scoop of all vegetable protein powder in chocolate form if you prefer. Get your blood pumping with this easy smoothie recipe. It’s chockfull of ingredients with antioxidants that boost blood flow and can help to keep your arteries clear. Prepare all vegetables by washing well and cutting to fit into your juicing machines feeding tube. Juice the tomato first. 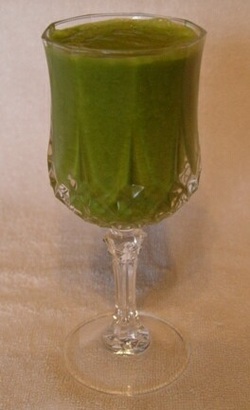 Juice the spinach, parsley, and kale next, then the romaine lettuce leaves and push through the juicer slowly. Add the remaining ingredients and stir well. For a cooler drink, make sure vegetables are chilled first. Spice with organic herbs as desired. Add ingredients in order to high speed blender. Mix for 1 minute or until smooth and creamy. Pour into popsicle molds and freeze. These are very yummy. You can add sweetener if you want, but they are sweet enough I think all by themselves. Blend all of the ingredients in a high power blender until very smooth. Pour into molds and freeze. Enjoy! Mix all of the ingredients in a high speed power blender. You may need to add more liquid to get it to mix well. Note: After mixing, this is really good to add raw cashews, almonds, or macadamia nuts to. Combine the black beans, dates, almond butter and vanilla in a food processor or high-powered blender such as a Vita Mix. Blend until very smooth. Add the remaining ingredients and blend again. Add nuts, if desired. Spread in a very lightly oiled 8x8" baking pan. Bake for 90 minutes at 200 degrees Fahrenheit. Cool completely and apply topping if desired. Cut into small squares. Store in a covered container in the refrigerator up to one week (if they last that long). Blend topping ingredients in a high powered blender such as a Vita Mix. This is a good topping for any cookie, brownie, or you can even use it as a dip for fruit if you like. You may want to thin it down for a dip. Sauté onion, peppers, celery, garlic in large sauce pan with a little coconut oil. Add tomatoes, beans, corn and simmer for 30 minutes. Add spices as desired. Add rest of ingredients and cook for an additional 30 minutes or so. Makes a large pot of chili. Chop the onion, carrots, and bell pepper and put in a large stock pot. Cover with water and bring to a low simmer. Mince garlic and add to the pot, along with the tomatoes, Spike, and spices. Add red and white kidney beans and garbanzo beans. Add more water if needed, until soup is desired consistency Let simmer for an hour or two. Chop up Swiss chard leaves. Add green beans, corn, and chard to the soup and simmer another 15-20 minutes. Add black pepper and liquid Aminos. Enjoy! Combine mixed baby greens, orange segments, and cucumber slices in a salad bowl. combine vinegar and agave nectar in a bowl. Whisk in the oil. Pour dressing over salad. Add sesame seeds and herbs on top. Note: you can also add dried craisins, toasted almonds, or other garnishes as you wish. Toss all of the above ingredients together. Mix dressing together and chill well. Drizzle desired amount on salad when ready to serve. The dressing goes a long way. You may add additional vegetables to this as well, carrots, green peppers, beans, or whatever you like. Have you ever noticed that the only kinds of chips that you can find are plain, or have tons of salt in them? You can find many flavored chips that are hot, spicy, salty or any variety, but can you find cinnamon or sweet chips? If you can, then what a great, but they don't have them where we are. So what is the remedy when you want some sweet chips to dip in fruit salsa? Make your own! This is easily done and more nutritious anyway than any store bought chip that is full of ingredients that you can't even pronounce. You can either make your own flour tortillas or purchase them in the store, or at your local farmer's market perhaps. This recipe is assuming that you purchase the tortillas already made. Preheat oven to 400 degrees F. For cinnamon chips, light spray tortillas with water using a spray bottle. Combine sugar and cinnamon in a sugar shaker and sprinkle over the tortillas. Cut each tortilla into 8 wedges. Place in a single layer and bake on a cookie sheet or stone baking stone. Bake 8-10 minutes or until lightly browned and crisp. Remove and cool completely. You can use pretty much any fruit that you desire, but this is a recipe that we enjoy. Peel, core, and slice the fruit into a large bowl. Add some orange zest from the rind of the orange (if it is organic) and some orange juice to keep your fruit from turning brown. You can add sweetener if you like, but we don't add any. Some people will add grape or apple jelly, but we think it tastes sweet enough on its own. Mix all of the ingredients well and serve with cinnamon chips. If you have never used hand made soap, then you cannot possibly know what you are missing. The poorest batch of handmade soap is more superior than the "best" store bought bar. Your imagination is only limited by the types of raw materials that you use in your own recipe. We will post recipes there that we have personally tried and they have proven to be excellent types of soaps. If you do not know the process to make soap, please study and know how before attempting to make any kind of soap, as it can be dangerous if you do not know what you are doing. Have fun and email us with any questions/comments. This recipe is posted with the understanding that anyone using it has a good knowledge of how to make soap. This is a cold processed soap recipe. Be sure to employ all of the safe standards of making soap, such as using protective personal equipment (goggles, gloves, apron, etc.). We assume no liability if you do not follow the safety recommendations in making soap. Before you attempt to make any soap recipe, make sure you understand the whole process and have the correct supplies on hand. This will assure you of creating a beautiful batch of soap. Notes: Although dried lavender buds may be used in this, we find them to be a bit abrasive and harsh on the skin, so we do not use them in our soap. You can modify this recipe to suit your own style. We have also added lavender and rosemary infused oil to make a very nice batch of soap. If you have any questions, send us an email and we will respond promptly. Enjoy! Great lathering, long lasting, moisturizing, feels good. For easier mixing, I like to melt the hard coconut oil in the microwave first. I then add the fractionated coconut oil, trace minerals and essential oil and mix it all together. Then I add the Xylitol and mix well. Then add the other ingredients and mix well. Store in jar and use about 1/4-1/2 teaspoon for each brushing. Rinse well as the activated charcoal will tend to make more of a mess. I like to start out each day doing a coconut oil pulling and then follow up with brushing with this toothpaste. It is a great oral hygiene to follow. Melt first 3 ingredients over very low heat. When they are all melted, add the essential oils. Mix well and pour into containers. This contains no petroleum products and it smells wonderful.